After the Bolder Boulder we headed for the Great Sand Dunes. Todd took us on a minor detour without telling me where we were going. I was not expecting what I saw on the side of that hill. 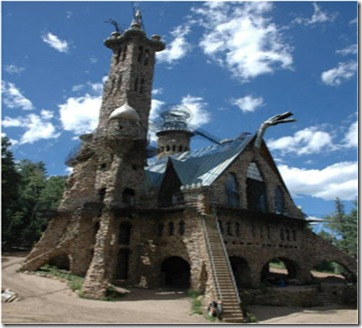 A radically anti-government guy named Jim Bishop has been building a giant castle out of big rocks and wrought iron on his property since 1969… by himself. The top of the tallest tower stands 160 feet up! And yes you can go all the way up there on rough hand-built steps. It was really nerve wracking. He built a metal dragon head on the peaked roof that will be capable of spitting fire 30 feet! Unbelievable. In the evening we watched the sunset over The Great Sand Dunes and the whole San Luis Valley from our lodge room porch. What a view! As for your Bolder Boulder time…Awesome!